The SJSU affair falls somewhere between educational research and a social experiment, and we are very much in need of better experiments in these areas. Most educational research is pretty abysmal. Most social policy goes untested. The lack of decently designed experiments in these areas generally allows the people with the most money and policy clout to determine what constitutes truth in this space. And people suffer because of that, every day. So we need more experimentation. 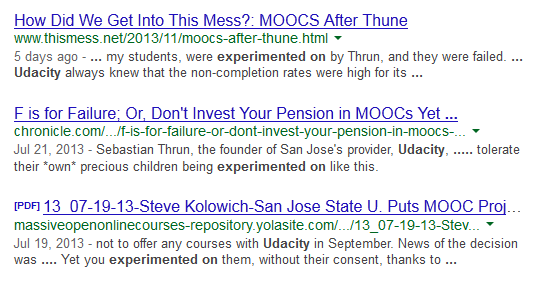 And we probably need better experiments than SJSU, where Udacity demonstrated negligence in offering students an experience they should have known to be inferior. I am not arguing that we should shrug our shoulders at a company that takes student failure too lightly, or directs policy interventions disproportionately at the powerless. But “experimented on” somehow implies to me that the rest of us are not making choices every day on how we educate students. I used a team-based model in my third iteration of a statistical literacy class I taught, and I tracked its effectiveness. Results were mixed. Was I “experimenting on” my students? I introduced peer instruction another semester. I was certainly experimenting with my delivery — but was I experimenting “on” the class? I’d say no. I was altering instruction to find out what worked best, and paying attention to the results. This, broadly, is what it means to be a professional. And I don’t think that changes at the institutional level. I was not using my power as a teacher to collect data on stress reactions to various forms of supersonic pitches, or on heart rate reactions to violent imagery. I was trying to do the best I could at what both society and the students were paying me to do. I’m eliding a lot of concerns here for the sake of brevity. I’m happy to argue this more deeply in the comments. But “experimented on” sounds to me like the ickiness is coming from the use of a formal design. That’s wrong, in so many ways. In reality, the ethical considerations in situations like SJSU are both more broad and more narrow. Such activities are unethical if the treatment received by either of the test groups is unethical, end of story. If the treatment of the Udacity students is unethical inside the experiment, it would likely be unethical had no experiment framed it — the fact that we’re tracking outcomes has little to do with it. Likewise, if the use of Udacity for this purpose is an acceptable policy option outside of an experiment, then the use of random assignment to assign it is ethically neutral. To my ears, the phrase “experimented on” confuses that issue by imposing a particular set of ethical concerns that only exist once we decide to track outcomes, or use random assignment to allocate limited resources. So please — argue whether offering such courses as educational alternatives is ethical, and debate whether experimentation that tends to target those alternatives at poorer schools is socially just. But let’s not create the impression that it’s the presence of the experiment that makes these solutions ethically dubious.